Cast- Salman Khan, Katrina Kaif, Paresh Rawal, Kumud Mishra, Angad Bedi, Sajjad Delfrooz, Girish Karnad & Nawab Shah. More than 5 years after the blockbuster Ek Tha Tiger, Yash Raj Films, superstar Salman Khan and Katrina Kaif are back with it’s sequel titled Tiger Zinda Hai. Directed by Ali Abbas Zafar, this action thriller is based on the true incident of 2014 when Islamic State of Iraq and Syria (ISIS) abducted 46 Indian nurses in Mosul, Iraq. Tiger Zinda Hai resumes the story eight years after from where the first part was ended. The film starts on an engaging note where an American spy gets beheaded in Iraq by the world’s richest & most dangerous terrorist group ISC whose leader is Abu Usman (Sajjad Delfrooz). After the incident, American army launch an attack on their convoy, in which Abu gets injured by a bullet shot. Abu’s men take him to the hospital for the immediate treatment and kill everyone from the staff who tries to stop them. They take over the entire hospital and keep all the 40 nurses (25 Indian & 15 Pakistan) who work there, as hostages. Then Americans decide to launch an airstrike on the hospital, but to take out Indian nurses safely, RAW senior officer Shenoy (Girish Karnad) request them to delay the airstrike. Therefore Indians get 7 days to freed their nurses, but to invade the high security region of ISC in a week is next to impossible. Shenoy suggests, that only Tiger (Salman Khan) can complete this dangerous mission in such a short span of time. RAW agents find Tiger who is living somewhere in Austria with his wife ISI agent Zoya (Katrina Kaif) and son Junior. Here the entry of Salman Khan is whistle-worthy and matches the level of superstar. The entire wolves sequence is quite impressive and very well executed. On the other hand, Katrina Kaif introduces normally but her initial fight scene is a surprise pack for fans. Shenoy asks Tiger for help but he denies and gives him a pendrive which has the details of capable agents who can accomplish the mission. Zoya convinces him to take up the job, now how he manages to rescue the nurses is quite thrilling & forms rest of the film. 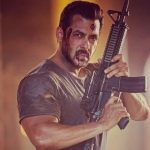 Tiger Zinda Hai is the second collaboration of director Ali Abbas Zafar with Salman Khan after 2016’s Sultan and he has done a noticeable job. Ali & team have handled all the sections very well and made a film that definitely deserves your time. Yes! the length could be the problem but you have to manage with it. Talking about the performances, then the sturdy Salman Khan is the Optimus Prime of Tiger Zinda Hai who has delivered a solid performance. Katrina Kaif has also performed terrifically and looks more eye-catching than Salman in combat scenes. Her presence on screen is quite charming as always. 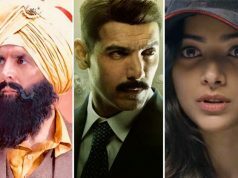 Sajjad Delfrooz as Abu Usman, Paresh Rawal as Firdaus and Kumud Mishra as Tiger’s team mate have left a strong impact with their performances, rest all have also played their characters very sincerely. 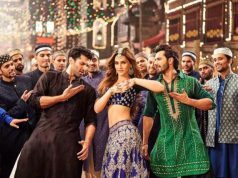 Vishal-Shekhar’s music is decent, despite the chartbuster song Swag Se Swagat and the melodious one Dil Diyan Gallan. 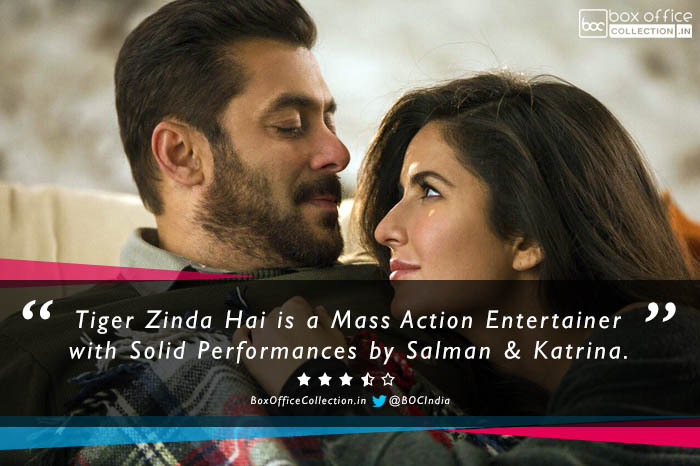 Overall Tiger Zinda Hai is a mass entertainer that keeps you gripped throughout but with lazy eyes, it definitely should have been trimmed by 10-15 minutes. It is high on hard-hitting action garnished by patriotism and India-Pakistan peace theme with pinch of romance. 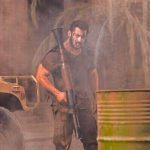 Review of movie Tiger Zinda Hai, starring superstar Salman Khan and Katrina Kafi in lead roles. Sequel to 2013's Ek Tha Tiger, it's a mass action entertainer that keeps you gripped throughout.